In our last post we looked at our people’s story of emergence from the waters of Saakiiweesiipiwi (St. Joseph River near South Bend, Indiana) onto Myaamionki, our traditional homelands. As we saw in that story, our ancestors constructed a village at that location, but after an unknown amount of time they left. This journey from Saakiiweeyonki was the first in a long series of journeys in which our ancestors slowly settled our homelands. Map 1: Myaamionki originally constructed by Brett Governanti. Village sites by George Ironstrack. The best narrative we have of how our people spread throughout Myaamionki comes from Charles C. Trowbridge. In 1824, Trowbridge interviewed two key Myaamia leaders: Pinšiwa (J.B. Richardville) and Meehcikilita (Le Gros). These two men shared with him their perspective of how Myaamia people settled the Wabash River Valley and beyond. As each site is introduced please refer to the map (above) to get a sense for where each of these important villages were located. If you would like to see a more detailed map, click on “View Larger Map” below or click here to go to Google Maps. Pinšiwa and Meehcikilita stated that after leaving Saakiiweeyonki our ancestors built a village near the confluence of Sakiiweesiipiwi (St. Joseph River) and Mihšiiwiateehi Siipiiwi (Elk Heart River). This village they named Mihšiiwiateehi (Elk Heart) because of a story about two women who fought over the heart of an Eastern Elk that had been hung in a tree to dry. Today, the city of Elkhart, Indiana lies on this spot and still bears an English translation of the name our ancestors gave to that place so long ago. From Mihšiiwiateehi our ancestors then moved to build a village where the Kociihsa Siipiiwi (different St. Joseph River that runs through eastern Indiana) and the Nameewa Siipiiwi (St. Marys River) combine to form the Taawaawa Siipiiwi (Maumee River). In time, this village was named Kiihkayonki and it grew to become the largest and most well known of our ancestors’ villages. Our ancestors built Kiihkayonki in a great location for both farming and trade. The three rivers next to the village flooded yearly and created great fertile bottomland for planting and growing crops. The village also sat at the northern end of a trail that linked the Taawaawa Siipiiwi (Maumee River) to the Waapaahšiki Siipiiwi (Wabash River). This trail, or portage, was a key linkage in a trade route that joined the Great Lakes to the Gulf of Mexico. The trade route was used by many indigenous peoples prior to the arrival of Europeans and its importance only increased when the European fur trade began in the 1600s. Eventually, Kiihkayonki grew so large that the surrounding landscape could not support the population with enough food. When this occurred a group would choose to split off and set up a village downstream on the Waapaahšiki Siipiiwi (Wabash River) or its feeder streams. The exact order in which the following villages were settled is not exactly clear to us today. So instead of looking at the settling of our ancestors’ villages from a chronological point of view, we are going to look at them from a geographical perspective. So let us follow the course of the Waapaahšiki Siipiiwi to the southwest and point out each major village site along the way. The first significant village site we pass as we walk south sits where the Kineepikwameekwa Siipiiwi (Eel River) flows into the Waapaahšiki Siipiiwi. This village was often referred to as Kineepikwameekwa and was called the Eel River Village in English. At various times in our history, this village moved from the confluence with the Waapaahšiki Siipiiwi to the headwaters of the Kineepikwameekwa Siipiiwi and back again. The headwaters location put the village much closer to Kiihkayonki and the important trade and defense resources that could be drawn on there. Today the city of Logansport, Indiana lies at the confluence of the Kineepikwameekwa Siipiiwi and the Waapaahšiki Siipiiwi and Columbia City, Indiana lies near the headwaters village site (Map 1 shows the confluence location near Logansport, Indiana). After about two days journey by foot following the course of the Waapaahšiki downstream we would reach its confluence with the Kiteepihkwana Siipiiwi (Tippecanoe River). In our language, the name for this river refers to the Buffalo Fish that are prevalent in this stream. This village was often just called Kiteepihkwana in our language, but English speakers usually distorted this into “Tepicon” and later into “Tippecanoe.” The village site is about ten miles northeast of Lafayette, Indiana. However, like the preceding village, the Kiteepihkwana village did shift locations in its history from the confluence location to a location near the headwaters. The headwaters location put the village much closer to Kiihkayonki and the resources located there. Today, this headwaters location is somewhere to the east of Old Tip Town, Indiana (Map 1 shows the confluence location near Lafayette, Indiana). Another day’s journey downstream would bring us to the site of Waayaahtanonki (at the Whirlpool). In the 1820s, Pinšiwa and Meehcikilita stated that one man, Waayaahtanwa (Whirlpool Person), led the migration from the north that established this village. His name referred to a whirlpool that existed in the river near his original home. Ultimately, this entire new village and the people who lived there took on the name Waayaahtanwa. This name was eventually shorted in English to “Wea.” Today, many of the descendents of the people of this village are citizens of the Peoria Tribe of Oklahoma. Eventually Waayaahtanonki increased in population and this pressure required the creation of a new village downstream from this one. To reach this next location we would have to journey three to four days southward along the Waapaahšiki to its confluence with the Oonsaalamooni Siipiiwi (Vermilion River). The people who settled here were called Peeyankihšia on account of them ‘splitting off’ from the others. This village at the confluence of the Oonsaalamooni and the Waapaahšiki became the first Peeyankihšionki (Place of the Piankashaw). To the best of our knowledge this site lies somewhere to the northeast of the town of Cayuga in Indiana. Sometime after the founding of the first Peeyankihšionki, a group split off and moved south following the Waapaahšiki to just above its confluence with the Embarras River. In that spot they built a village called Aciipihkahkionki (Place of Roots). This name referred to the abundance of tuberous plants that grew in the area. Before the years of disruption and war that accompanied the American invasion of our homelands, tuberous plants like ahpena (wild potato), poohkihšiikolia (lotus root), oonsaapeehkateeki (Jerusalem Artichoke root), and mahkohpena (lily root) formed a staple part of our ancestors’ diet. It is with no surprise that such an area would make a great place for a village. Today the city of Vincennes, Indiana lies in the vicinity of this historic Peeyankihšia village. Many of the descendants of the Peeyankihšia who built this village and the village to its north are citizens of the Peoria Tribe of Oklahoma. The village at Aciipihkahkionki was the largest Myaamia-speaking village on the southern reaches of the Waapaahšiki. 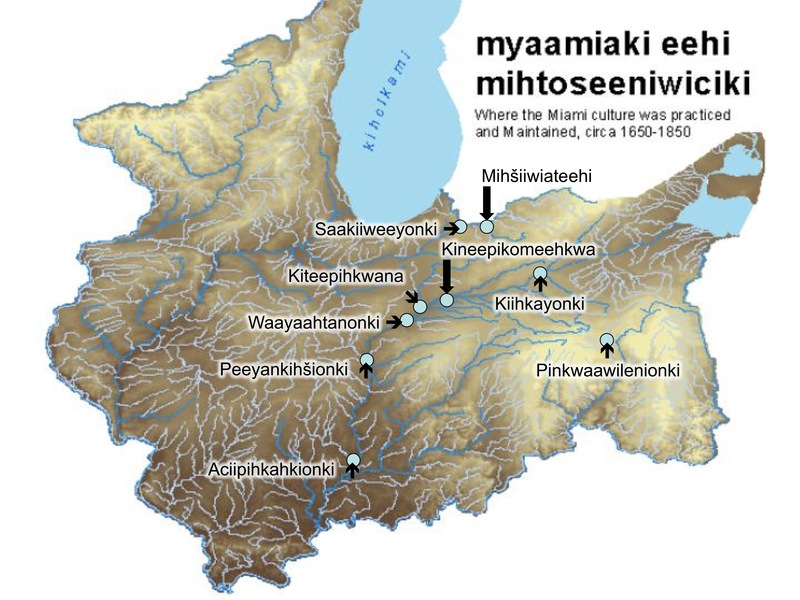 There were a few larger Myaamia villages outside of the Wabash River Valley, like Šikaakonki (Chicago, Illinois) and Pinkwaawilenionki (Piqua, Ohio). There were also smaller villages and hunting camps as far south as the Kaanseenseepiiwi (Ohio River) and as far west as the Mihsi-siipiiwi (Mississippi river), but these locations moved from year to year and did not leave substantial traces of evidence, in the archaeological record or in our own stories. Except for a few exceptions described above, our people’s historic villages were concentrated on the Waapaahšiki Siipiiwi between Kiihkayonki (Ft. Wayne) and Aciipihkahkionki (Vincennes). However, our ancestors regularly traveled, hunted, and gathered throughout the landscape we call Myaamionki (see Map 1). Extensive hunting and gathering grounds were a necessity because this was a shared landscape. All the peoples who called this area home – Shawnee, Kickapoo, Illinois, Potawatomi, Ojibwa, Delaware, and Wyandot (just to name a few) – needed to hunt and gather. Over time, animal and plant populations changed and villages moved. As a result, our ancestors had to vary the locations where they hunted and gathered. In times of scarcity, and because of the need to rest the natural resources, our ancestors even went so far as to cross the Kaanseenseepiiwi (Ohio River) into what became the state of Kentucky and the Mihsi-siipiiwi (Mississippi River) into what became the states of Iowa and Missouri. Our ancestors were well traveled within Myaamionki as well as beyond our places. In later posts we will explore how far our ancestors traveled in order to trade and to make war. With villages spread over hundreds of miles of the Waapaahšiki and the people of each village traveling hundreds more miles to hunt and gather, one great question that some have asked is: what held all these separate villages together as a group? Prior to contact with Europeans, the people of each village had their own decision-making processes and leadership. No village could command the allegiance of any other village. Given that reality, what did connect these villages together in a group that was distinctly different from other tribes in the area? In our next post we will take a deeper look at the elements that formed a web of connections, which tied the people of these villages to each other in deeply meaningful and powerful ways. Waapanaakikaapwa (Gabriel Godfroy) told this story to J.P. Dunn in the early 1900s. See “Where the Miamis First Came From” in David Costa ed., myaamia neehi peewaalia aacimoona neehi aalhsoohkana – Myaamia and Peoria Narratives and Winter Stories, (Oxford, Ohio: Miami Tribe of Oklahoma and the Peoria Tribe of Oklahoma, forthcoming), 52-53. Helen Hornbeck Tanner and Miklos Pinther, Atlas of Great Lakes Indian History (Civilization of the American Indian series; v. 174. 1st ed. Norman: Published for the Newberry Library by the University of Oklahoma Press, 1987), 32-33. C. C. Trowbridge, W. Vernon Kinietz, and Burton Historical Collection. Meearmeear Traditions (Ann Arbor: University of Michigan Press, 1938), 7-10. Brett J. Governanti “The Myaamia Mapping Project.” Map, GPS, and Riverine, Miami University, 2005. Trowbridge, Meearmeear Traditions, 10. Michael McCafferty, Native American Place Names of Indiana (Urbana: University of Illinois Press, 2008) 14-15. Trowbridge, Meearmeear Traditions, 10. Tanner, Atlas of Great Lakes Indian History, 40-41, McCafferty, Native American Place Names of Indiana, 76-87. Richard White, The Middle Ground: Indians, Empires, and Republics in the Great Lakes Region 1650-1815 (Cambridge: Cambridge University Press, 1999) 448-49. Trowbridge, Meearmeear Traditions, 10-11. Tanner, Atlas of Great Lakes Indian History, 40-41. Tanner, Atlas of Great Lakes Indian History, 40-41. McCafferty, Native American Place Names of Indiana, 112-114. McCafferty, Native American Place Names of Indiana, 120-23. Tanner, Atlas of Great Lakes Indian History, 40-41. Trowbridge, Meearmeear Traditions, 10-11. Tanner, Atlas of Great Lakes Indian History, 40-41. McCafferty, Native American Place Names of Indiana, 126-31. Trowbridge, Meearmeear Traditions, 11. Tanner, Atlas of Great Lakes Indian History, 40-41. McCafferty, Native American Place Names of Indiana, 132-35. Trowbridge, Meearmeear Traditions, 11. Tanner, Atlas of Great Lakes Indian History, 40-41. McCafferty, Native American Place Names of Indiana, 141-43. Tanner, Atlas of Great Lakes Indian History, 32-33, 40-41. Thank you for this interesting story. Do the Myaamiaki have a legend of the Great Flood? aya Travis, I apologize for the delay in responding. We were all wrapped up in community language programs this summer. iihia (yes) the Myaamiaki had a aalhsoohkani (Winter Story) about a flood. Only a fragment of this story has survived – we know that our grandfather Wiihsakacaakwa together with some animals survived the flood and together they remade the earth. At the end of the month, I’m speaking in Viroqua, Wisconsin of the Flood Stories of the various Original Peoples of the Driftless bioregion (S.W. Wisconsin), and will mention that the Myaamiaki hold this fragment. Mr. Ironstrack, this is a wonderful blog. I’m not a member of the Miami Nation nor a descendent of the Eastern tribe. I am interested in the Indigenous history of Indiana, thank you for this resource.